Enter the tribal village up in the Northern Thailand and try out theirlifestyle. Admire their colorful and very special costumes. 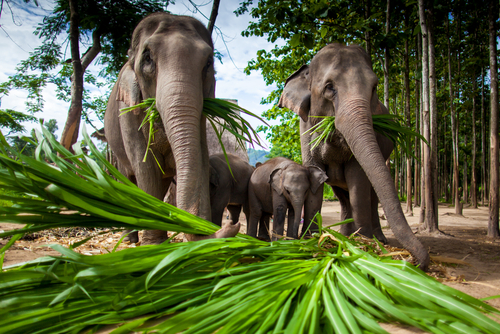 Live in authenticcottages whilst enjoying all the tourist activities Chiang Mai has to offer,such as watching the elephant show, riding on elephants, trying deliciousThai food, and visit other cultural landmarks! Breakfast be serbed in the village. Head towards Chiang Dao Cave by a 4x4 WD. Stop for lunch before visiting various hill tribes (i.e. Lisu and Akha). Then, drive to Doi Mae Salong to see the Chinese refugee village. Arrive in Chiang Rai in the late afternoon and transfer to the hotel where dinner will be served. Enjoy breakfast at the hotel. You will then visit the beautiful King’s Mother Garden, before proceeding to Mae Sai which is the northernmost city of Thailand. 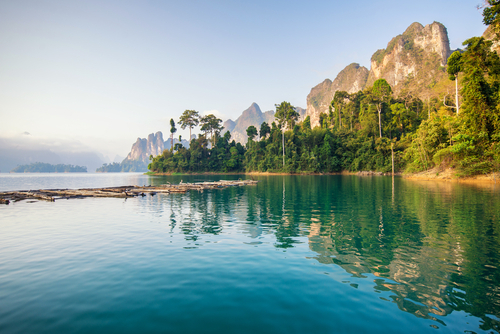 Visit the infamous Golden Triangle where the borders of Thailand, Laos and Burma meet. Take a boat ride along the Mekong River to ancient Chiang Saen. Enjoy lunch there before transferring back to Chiang Rai airport. 1)Transportation by 4x4 WD with English speaking guide. 2)Elephant ride, Ox cart ride, Bamboo rafting and Boat trip. 3)Accommodation in hotel as mentioned (3 nights). 5)Transfers between hotel and airport. * Note: a straw hat is recommended during summer season. 2) Expenditure of a personal nature i.e. laundry, telephonebills, drinks, souvenirs etc. 3)Air ticket and airport tax. Compass Holidays acts as an intermediary between transportation and airline companies, hotels, tourist offices andall other contractors providing services for tourists. Additional expenses incurred due to delays, accidents, naturaldisaster, political action and unrest must be borne by the clients. Programs and tours prices are based on the situationat the time of printing this proposal and could be subject to change due to local conditions. Participation in our tourprograms implies the client’s agreement to the above. We reserve the right to amend or alter any of the conditionsherein without notice from time to time and at its sole discretion. Prices shown herein are calculated in US funds and Canadian prices were converted from US based on Bank of Canada’s exchange rate. All prices are on a per person basis for double occupancy accommodation including the current taxes & V.A.T of each destination. All prices are dependent on fuel costs, applicable V.A.T and local taxes, rates of currency exchange and other variable factors and are subject to change at any time should major circumstances and currency fluctuates. We reserve the right to increase the price of any product should these costs increase. In the event that the increase excess of 7% (unless caused by an increase in government tax), you are entitled to receive a full refund and cancel the travel arrangements. Every effort will be made to advise you of any price increase at least 30 days prior to your departure date. The intra tour airfares are normally included (unless specified). The miscellaneous surcharges such as airport taxes, airline fuel surcharges are excluded. Compass Holidays makes every effort to ensure the accuracy of the information contained herein and to the best of its knowledge all information is accurate at the time of publication. We attempt to ensure that the prices in the brochure and on the website are accurate, however errors do occur and we reserve the right to refuse to accept bookings at any price published in error. Ii) Government actions, political issues, weather, equipment failure, labour disputes, sickness, theft or any other cause beyond our direct control. Vi) Cancellation of trip arrangements made by Compass Holidays, provide all monies paid by travellers are fully refunded back to travellers. Compass Holidays and / or its agents, act only as agent for travelers in all matters pertaining to the trips, we shall not be liable for any claims, losses, damages, costs, expenses, delays or loss of enjoyment, of any nature or kind whatsoever, resulting from events beyond our or a supplier’s reasonable control, including but not limited to acts of God, strikes, lockouts or other labour disputes or disruptions, wars, blockades, insurrections, riots, earthquakes, weather conditions, floods or acts or restraints imposed by government authorities. Compass Holidays shall be excused; discharged or released from its performance to the extent such performance is so limited or prevented, without liability of any kind. Except for verifiable extenuating circumstances, there are no refunds, whatsoever, for any unused travel arrangements and services including but not limited to accommodations, meals, intra tour transportation or sightseeing. Any refunds for unused travel arrangements and services shall be issuedin the sole discretion of Compass Holidays. Any adjustment considered will be based on the actual cost of the service involved and not on a per diem basis.